Relax at our historic bed and breakfast in Independence, Missouri. Located just ten minutes from downtown Kansas City, this turn-of-the-century mansion is the perfect place for your overnight lodging accommodations, private dining event, business meeting or wedding. Sitting on two acres with ample off-street parking in a quiet residential neighborhood, the estate provides the space for quiet relaxation, while the stately stone mansion, featuring hardwood floors, hand-painted murals, and original woodwork, provides the elegance and comfort you would expect from a 19th century historic home. Guests enjoy the convenience of being close to all that is happening in the greater Kansas City and Independence areas, yet far enough way to avoid the congestion and hassles of urban living. Our location is convenient to all major highways and centrally situated for guests traveling the Midwest. We are just two miles from the center of historic Independence, home of Harry Truman, and a short drive away you’ll find Kansas City attractions, such as the Truman Sports Complex, home of Kauffman and Arrowhead Stadiums, Country Club Plaza, Crown Center, Union Station, Sprint Center, and the Power & Light District. There are many activities in the area to enjoy, including sporting events, shopping, and dining; but you don’t have to leave Hawthorn to have a wonderful time. Whether you are relaxing in one of several common area rooms to visit, reading the paper or a good book, or just enjoying your favorite beverage while coasting on one of our patio gliders; Hawthorn is the place to get away from it all. Unwind on the sun porch, play cards in the parlor, or walk the grounds ~ you can do it all. Hawthorn B&B’s extra-large, yet affordable guestrooms are the largest in the area. This affords guests the comfort they expect while maintaining the intimate elegance they can enjoy. All guestroom amenities include queen beds, private baths, cable TV, wireless Internet and more. The two-room Bibler Suite on the third floor has a king bed and a day bed. In true bed and breakfast style, a full, hearty, home-cooked breakfast is served each morning at your private table. There are no buffet breakfasts here . . . each morning’s breakfast is freshly prepared for each guest. Jim & Wendy Allen, owners of Hawthorn B&B and your hosts, provide the perfect hospitality for your stay. Ask for directions, a recommendation for lunch or dinner or information on one of the many places to visit or tour. The greater Independence/Kansas City area offers something for everyone. Whether it is historic, patriotic, artistic or athletic ~ including the many culinary choices for you to experience, let Hawthorn B&B be your headquarters for a truly memorable experience. Greetings to our guests and friends who visited us in previous years and to those who will visit for the first time during 2018! No matter the season it is always a special time at Hawthorn. Guests can enjoy a quiet respite for relaxation and recharging. Bring some friends with you and enjoy a card game in one our many common area rooms. The Music Room is ideal to enjoy great conversation or pull up chairs in the front Parlor for a challenging board game. If warmer weather is your preference, each spring & summer, Hawthorn comes alive with blooming trees and flowers. Our Sun Porch is a guest favorite for breakfast and a special spot to relax, read a book, chat with friends or just enjoy the serenity of the estate watching the numerous squirrels and birds busying about. Early risers or those enjoying the peaceful relaxation at dusk may catch a glimpse of one or our two families of rabbits! It is never too early to reserve your favorite room, each with its own in-room private bath. Call us direct or reserve from right here on our website! Our very close proximity (less than 10 minutes) to Kaufmann & Arrowhead Stadiums, home of the Kansas City Royals, Kansas City Chiefs and the Silverstein Eye Centers Arena home of the Missouri Mavericks Hockey Team, makes Hawthorn the ideal base for a trip to cheer on your favorite team. Find your Independence! With a relaxing weekend getaway, thrilling sporting event or explore the many attractions our great city has to offer. Hawthorn is your perfect headquarters to experience it all. Now is a great time to plan a visit and indulge yourself in the comfort of Hawthorn. Put your feet up after a busy day of touring and shopping in Independence and the surrounding areas and enjoy some well-deserved relaxation. Start your day with coffee right outside your door then enjoy breakfast at a time of your choosing at your private table. 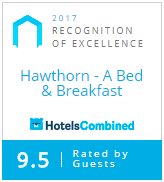 Breakfasts at Hawthorn are really something to experience! Choice of juices, fresh seasonal fruits, freshly baked muffins, delectable hearty entree with breakfast meats and Jim’s special breakfast potatoes…the perfect start to your day! Want to share Hawthorn with a friend or relative? Consider a Hawthorn Gift Certificate. Certificates are valid for one year from date of purchase. Give us a call or you can order on-line by selecting the link at the upper right corner of this page. We look forward to welcoming you and sharing the hospitality and elegance of Hawthorn, A Bed & Breakfast which so many guests have enjoyed for more than 17 years! You take “class & hospitality” to a whole new level. We truly enjoyed our second stay with you. We will be back!